Compost is a form of organic matter than can be used to amend soils and act as a fertilizer for vegetable or landscape gardens. Compost is free to create for the homeowner and can often replace and exceed the effectiveness of chemical fertilizers. In its simplest form, composting is gathering and storing decomposable items in a pile or bin outdoors and, after several weeks or months allowing the items to decompose into nutrient-rich humus. If you’re interested in composting, start a pile in a corner of your yard that is “open to the elements”- things like rain and airflow are crucial to the processes necessary to create compost. Contain the pile in a wooded area or simply construct a small fenced in area for the pile. Do not place your compost pile in close proximity it a stream, because excess nutrients can leach into the waterway. The longer the compost decomposes, the easier it will be to work with. Great things to compost: Grass clippings, leaves, pet manure, plant-based table scraps (vegetables, fruits, grains, etc. ), and some animal-based food scraps like egg shells. 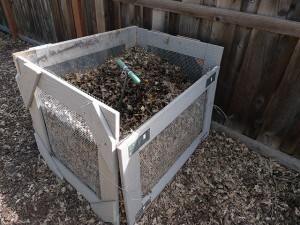 Things to think twice about composting: Animal-based table scraps. That fat you scraped off your pork chops is OK for your garden, but will also cause unwanted visitors in your yard like feral cats, racoons, skunks, etc. and are better left in the trash. Establishing trees is one of the top effective ways to reduce stormwater while adding benefits to human health and wildlife. Trees can require some time investment, but are well worth it for their ecosystem services and beauty.